You know how sometimes you receive a big box in the post, and you start to unpack it? You work your way through the tape and the cardboard. Then out fly a thousand little polystyrene piecelets that you'll still be fishing out from under the sofa in three months' time. Underneath that, a polystyrene mould to hold The Thing Itself in place. The Thing Itself is in a bag, so you take it out, then find it's also shrink-wrapped in tough plastic casing that is hard to cut through. Eventually you get it out and it's beautiful ... but there's not much of it, and why, oh why, that quantity of packaging? More Thing, please, and less material for the recycling bin? Welcome to Jonas Kaufmann at the Royal Festival Hall. He could scarcely have been on finer form if he'd tried. Having come successfully through surgery in early September for a node in his chest - it turned out, thank heavens, to be benign - the German tenor, man of the operatic moment, sounded fighting fit and ready for anything. In a programme mixing verismo arias familiar and less so, a bloom from Carmen, two Wagner jewels and four generous encores, he grew finer and finer as the evening went on. The concert programme held seven arias - surrounded by the polystyrene piecelets of orchestral bits and pieces that could have been fun had they been well played, properly rehearsed and a tad fewer in number. But that's the principle of such an evening. We want The Thing Itself and we will buy tickets. And if the "product" is 60 per cent packaging, there's nothing we can do about that. If The Thing Itself is worth it, we just accept the nonsense. This one was indeed worth it. Kaufmann's rise and rise has been magnificent to witness. It doesn't seem so long since his first CD of Strauss Lieder hit my desk and knocked me off my chair. "Do you know this man?" I asked here on JDCMB. Then we didn't. Now we do, and we're at his feet. What's the secret of his success? Several points stand out: strange, fabulous, magical. Strange: at first Kaufmann can sound like a baritone - that covered, whispered, speaking low tone. And then he reaches the high notes and there is nothing he can't do up there. Think: cathedral with fascinating architectural details below and high windows positioned specifically to allow the sun to pour in at the psychological moment. Fabulous: the control. Take one note, probably on the high side, and sustain it. Start at pppp and increase to ffff gradually, keeping the tone steady and pure throughout. That isn't usually how human breath works. Carmen Flower Song: the precise shadings of timbre as the story is told, the nuances of emotion articulated in each word, but also contained in the sound itself. Fabulous too: the diction, German, Italian, French, and the snapping from one style to the next. Richard Tauber's 'Du bist die Welt fur mich', encore no.2, sung almost like Schubert, with an innigkeit suggestive of layers of meaning beneath the surface. Then, whoosh, we're in Pagliacci for encore no.3, 'Vesti la giubba', and we're listening to someone who really ought to be Italian, the way he twirls and spits the melodrama, those words, that laugh, that unbelievable melody. Magical: his ability to transform himself into the character he's singing, no matter what's going on around him. Above all, Lohengrin. Kaufmann slid into 'In fernem land' as if there could be no more tender, visionary, perfect creation in the history of humankind. As if he really was destined to find the Holy Grail (pace Monty Python). As if he had just parked his swan outside by the Thames and would be off to resume the Grail Quest as soon as the concert was over. That exceptional tenderness was true, too, of his last encore, Refice's 'Ombra di nube', a sliver of under-known perfection that calmed everyone down (after 'Vesti la giubba' had rawked the auditorium). He's a real pro, of course, making the very most of the occasion, working the hall, hugging the conductor before pushing him back onto the podium for one more encore. And this was a fabulous evening, one that I think everyone in the packed-to-rafters RFH will remember for years to come. There's a sour aftertaste nonetheless: must the orchestra and audience be treated like budget airline customers? When corners are cut, people know it. For one thing, I didn't spot any translations anywhere in the house: not in the programme (£6), nor any quickly photocopied sheets of paper. A lot of people wanted them and they weren't there. This audience would also have liked better orchestral playing, which goodness knows the RPO is capable of if it has time to rehearse a programme of this length properly. They had another demanding concert the night before and scant chance to do justice to the music they were bashing through. You have to realise that rehearsing costs money... They did the best they could under the circumstances. 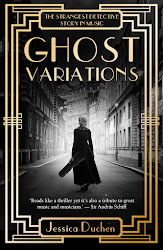 It's good that there were a few moments when they sounded inspired: the cellos duetting with Don Jose in the Flower Song, lifted to a new level by the marvel of the voice they were shadowing. But this audience knew what was going on. This wasn't a typical "light classics"-style date and it attracted a different crowd: an upmarket collection of opera buffs and Kaufmann fanatics, ready to listen to Zandonai and Wagner from the classiest tenor on the planet. The bluff was called: during the standing ovation one solitary but loud boo rang out, to the distress of those around it. A nutter? A jealous unemployed tenor? Or perhaps someone who felt ready to tell the promoter a home truth or two? He was drowned out by the cheering - but was noticed. 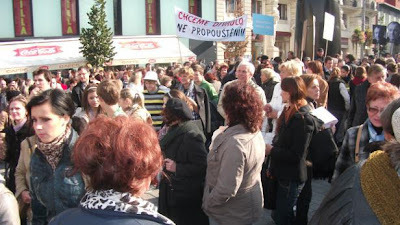 A distress call from Brno in the Czech Republic signals the latest cultural victim of the "financial crisis". 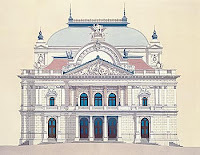 The opera house in Brno is the country's second-largest, and has a long, distinguished history: not least, the city was the home of Janacek, composer of a raft of the early 20th century's finest operas, and it was also the birthplace of Korngold. 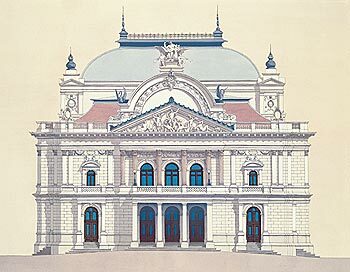 According to our correspondent, the budget of Brno's cultural institutions has already been chopped by 20 per cent. The next step, it seems, is that the opera house's ensemble, chorus and orchestra are, allegedly, to be disbanded. The email I've received suggests that the plan is that they will be taken back after seven months, but that there is no guarantee and the employees don't believe that that will happen. Besides, they have to eat, so they're not likely to sit about waiting, just in case, but will have to seek employment elsewhere. One of the immediate casualties is the planned staging of Korngold's Das Wunder der Heliane in the 2012-13 season, which would have been a co-production with Kaiserslautern. There's a petition online to save the opera house's ensemble, and the affected performers would be mightily grateful if you'd like to sign it. It's in Czech. Click here. Update: above right, a photo of the protests this situation has sparked. I've posted some Czech links in the comments box below, too. Beware, friends. You don't know what you've got until it's gone. Institutions that have taken decades or centuries to establish can be swept away in one stroke of a pen. We live in a copycat world. Such precedents are much more dangerous than you might fondly imagine, of a Sunday morning. Here's Lotte Lehmann - the first Heliane - singing the opera's most famous aria, 'Ich ging zu ihm'. JDCMB regulars will have heard it before, but that is no reason not to hear it again. Please sit back, turn up the sound and welcome some of the greatest Lisztians of all time to play some of my personal favourites... I hope you enjoy this selection as much as I've enjoyed choosing it. It's the tip of a very, very hefty iceberg, needless to say. Responses and further links welcome. Friday Historical: Happy Birthday, Solti! 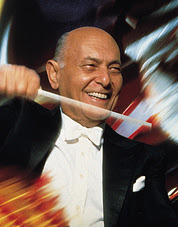 Today Sir Georg Solti would have been 99 years old. "My life is the clearest proof that if you have talent, determination and luck, you will make it in the end," he once said. "NEVER GIVE UP." In February 1997, when these memoirs were nearing completion, I conducted Bela Bartok's Cantata profana with the Berlin Philharmonic and the Hungarian Radio Chorus, and while the performance was in progress a great realization came over me. I understood that my whole life, the whole journey I have made, is contained within the story of the Cantata. Bartok, one of my teachers at the Liszt Academy in Budapest, had translated the Cantata's text from Romanian into Hungarian. It tells the story of a father who brings up his nine sons to be stag-hunters, instead of farmers or merchants - 'average' men. As the sons grow, they press their hunt into ever more remote areas of the forest, until one day they cross a haunted bridge and are themselves transformed into beautiful, enchanted stags. The father, worried by his sons' prolonged absence, sets out to look for them; eventually, he crosses the bridge, reaches a wellspring and sees the nine stags. He aims his rifle at the biggest of them, but just as he is about to shoot he hears the stag speak. The stag tells him that he is the eldest of the sons - the father's favourite - and he warns the father that if he tries to shoot any of the stags their antlers will tear him to pieces. "Come with me," the father begs his sons. "Your mother stands waiting, lonely, loving, grieving...The lanterns are lit, the table is set, the glasses are filled..."
"We shall never return," says the son, "because our antlers cannot pass through the doorway." The work ends with the man's heartbreaking realization that his sons have become alien to him and will never again be what they were before. I had always interpreted this story as an allegory of Bartok's life, but as I conducted the Cantata that day I realized that I, too, was the stag. I was born and trained to communicate music, just as the sons were born and trained to hunt, and I was lucky to have grown up in Hungary, a country that lives and breathes music - that has a passionate belief in the power of music as a celebration of life. But one day, while I was still young, I was parted from my family and left my native country. I hunted and searched for music, and destiny turned me into the object of my hunt. The circumstances of life became my "antlers" and prevented me from returning home. I do not mean to exaggerate my importance, but, like other internationally recognised musicians, I belong to everyone and share with the whole world all I have to offer. The musical and personal rewards of the life I have led have been great, but so have the sacrifices. 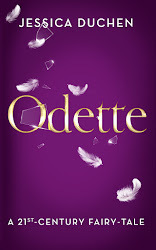 And there were times when I felt that the rewards would elude me forever." Solti conducted some of the most memorable concerts I was fortunate enough to attend - I still recall his Mahler 5 at the RFH in c1988, a rendition I long to hear again almost every time I witness any other conductor trying to bring off that piece. Then there was the evening that Decca celebrated his 80th birthday with a party in a big London hotel at which they presented him with the gift of a mountain bike. And of course I'll remain ever grateful to Lady Valerie Solti, who spoke at the Hungarian Cultural Centre launch party for my Hungarian Dances three years ago and described the resonances that its narrative held for the story, too, of Sir Georg. After Sir Georg's death, Valerie and their daughters established the Solti Foundation, which gives grants to young musicians to aid them in the awkward transition from music school to entering the profession, helping with coaching, travel to competitions, hiring rehearsal facilities, etc. To date, they have received applications from 40 countries. More details here. No, it's not another Beethoven cycle... Instead, British pianist Anthony Hewitt has come up with an exceptionally energetic way to stun several birds at one swoop. In the run-up to the London 2012 Olympic Games he will be cycling from Land's End to John O'Groats. Behind him follows his trusty Van Beethoven, containing a grand piano. Each evening he'll give a recital wherever he stops. And it's all in aid of excellent causes: pop some coins in the bucket, sponsor him or come to a concert and you're helping to raise funds for charities that aim to inspire children to take up music and/or sport, notably Big Noise, Musequality and Get Kids Going. Right now he's busy training. And he promises to wear more clothes than the original Olympians...watch out for them in this video he's made to explain the hows, wheres and wherefores. The whole tenor of Italy? Just back this evening from a very lovely week in Puglia. Olive groves, wild waves, Greek ruins, red wine, visiting cat, heaps of sleep, absolutely crazy drivers, crooked car hire, last of the October sun and I read Wolf Hall in its entirety. Ended up dreaming nightly about Henry VIII. Returned to find my interview with a certain rather popular Italian tenor was in today's Independent. And I'm glad to say that it made a mention in the Editor's Letter in the i as well. The interview took place at David Bailey's studio; watching the photo session was quite an experience. (Left, in the studio with Veronica, Andrea and David... I'm lurking in the background.) The famously gruff photographer remarks that "opera singers are always good fun". And if you want to spend a four-figure sum without decimal points on a massive 'Opus' about Andrea Bocelli, now is your chance. In his airy studio in Clerkenwell, David Bailey is hard at work photographing the most popular tenor on the planet. Andrea Bocelli poses quietly, reflectors and flashes creating a light-filled aura around him. His fiancée, Veronica Berti – 25 years his junior and pregnant with their first child (Bocelli’s third) – hovers with the observing entourage, helping to talk him through the session. Amid the fuss, Bocelli, smiling and soft-spoken, his sightless eyes closed, seems the still point of a hyperactive world. The aim of all this is to produce a David Bailey portrait of the singer for The Official Andrea Bocelli Opus – a project of huge scope and dizzying cost all about his life and work, running to more than 800 pages. The book is designed as a luxury collector’s item and will retail for a four-figure sum. Other productions in the Opus series have been devoted to Vivienne Westwood, Michael Jackson, Ferrari and the Arsenal football team. Iconic names and brands, then, and Bocelli is one too: with over 70 million records sold to date, he is beyond the cosmos when it comes to popularity. His Sacred Arias entered the Guinness Book of Records as the highest-selling solo classical album of all time. Yet in the classical field, many are still trying to work out the secret of his success. Bocelli’s fans don’t bother with operatic snobbery: ever since his first album went platinum in 1994, they have bought his discs and flocked to his performances, often in vast venues. Recently he sang in Central Park, New York; a DVD of the occasion will be on international release in November. During his visit to London, when I caught up with him, he also appeared in a special 50th anniversary edition of Songs of Praise on BBC1. But critics are not kind to him. 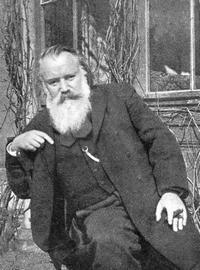 He gave a recital at the Metropolitan Opera in New York back in February – a programme of songs with piano accompaniment by composers ranging from Handel to Fauré via Beethoven and Strauss, taken from his latest album, Notte Illuminata – but the New York Times slated his “bland homogeneity” and “dogged, unrelenting quality”. His voice offers occasional glimpses of great beauty and deep emotion; at other times its limitations can seem downright clunky. Fans rave over the melting quality of his tone, its gentleness, its directness. Detractors grumble about its lack of expressive range and its pinched, nasal patina. Italy, of course, was the birthplace of opera and traditionally is viewed as the birthplace of great singers to match. Since Pavarotti, though, “real Italian tenors” have been in relatively short supply. For those there are, expectations run high, maybe too high. Italy itself is not what it used to be in terms of opera; the country has been severely affected by the financial crisis and up and down the country theatres have been threatened with closure. 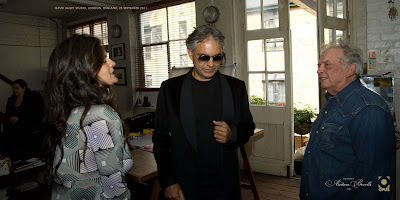 Bocelli is from Tuscany – what does he make of the state of his country? One question dogs Bocelli’s steps in the classical world: can he really be called an opera singer? Or should he be taken on board simply as ‘easy listening’? Purists tend to pigeon-hole him together with the likes of Katherine Jenkins and Russell Watson; it’s sad, if true, that he would be left at the starting line if you listened to him alongside today’s younger operatic luminaries such as Rolando Villazón, Jonas Kaufmann or Joseph Calleja. What, then, is Bocelli’s secret? The appeal of his struggle against adversity? The sweetness and vulnerability of his voice? Clever marketing? All of these probably play a role. But here’s a thought: the quasi-superhuman gifts of a Domingo are glorious, yet it’s hard to identify ourselves with them. Bocelli’s is the voice of the rest of us: we dream, we battle on, we do the best we can with what we’ve got. His voice could have been great. His triumph is that it doesn’t matter that it is not. His success is our absolution. Speaking of Hungary...my piece in this month's issue of Standpoint Magazine is all about the International Musicians' Seminar, Prussia Cove, Cornwall, which was founded by the great Hungarian violinist Sandor Vegh (right) and is now under the artistic directorship of Steven Isserlis. It remains probably the best course of its type in the country and possibly for further afield too. Steven endeavours to keep the values of Vegh and his circle going strong, and the fact that a large number of the most serious and accomplished young musicians in the world have been through these doors at one time or another is testimony to this great tradition's ongoing vigour and value. 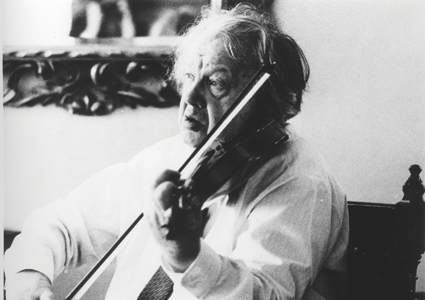 Frequent maestri include Andras Schiff, Ferenc Rados, Gabor Takacs-Nagy and more - Hungarian and otherwise. Here's the link to Standpoint, where you can read all about how Mr Vegh once tipped a glass of beer over Steven's head (and you know what his hair is like, so, um...). And more edifying stuff too, natch. ...Bartok is brilliant, and so are you, Nick Hillel and Esa-Pekka Salonen. I was lucky enough to have a sneak peek at the visuals that Nick's studio, Yeast Culture, is creating for the Philharmonia's latest multi-media project: Bartok's opera Duke Bluebeard's Castle, the culmination of the orchestra and Salonen's intensive exploration of Bartok that has lasted most of 2011. The production tours in the UK and aboard from 21 October. My article is in The Independent today, and if you follow this link you'll also see a video from the orchestra showing how some of the film was made. 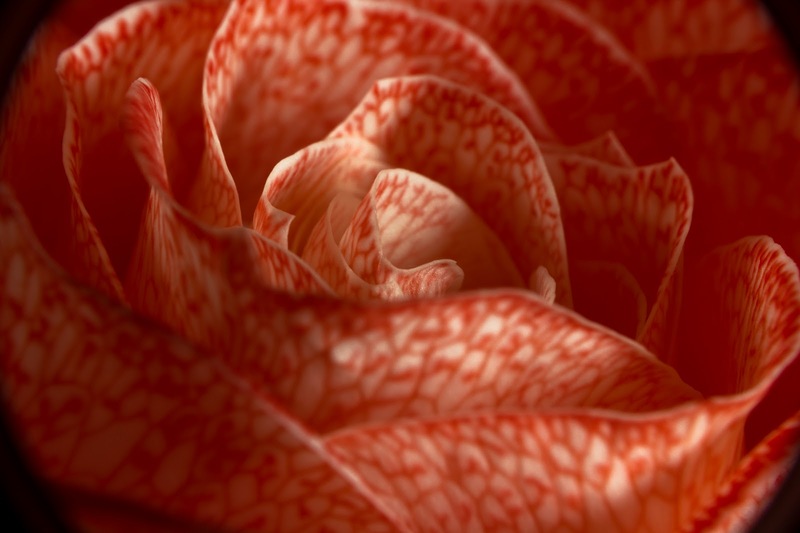 Left, Bluebeard's roses appear to fill with blood. He's a great artist and a brave man... Given the content of this interview, in which he does not mince his words one bit, I can barely imagine what's going through his mind as (above) he plays Schubert's Hungarian Melody, his encore at the Proms earlier this year. 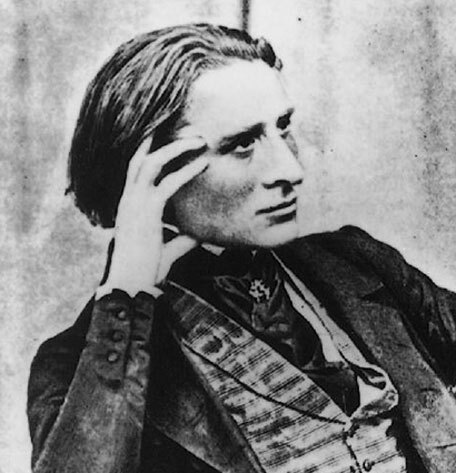 I'm writing a longer article about him for International Piano Magazine, which will go into more depth about the Schumann he's just recorded and will also look at why he's the only Hungarian pianist (as far as we both know) who just doesn't get along with Liszt. What a scoop for the Two Moors Festival. This plucky, determined organisation way out west between Exmoor and Dartmoor has had its share of rather impactful incidents. Back in 2007 they bought a Bosendorfer, for which they'd bust many guts to raise funds, and someone dropped it during delivery (no, it wasn't OK). Now, though, they've found something altogether more resilient, and it's by Brahms. Ashley Wass and Christoph Berner are the two lucky pianists who will give the UK premiere in St Andrew's Church, Ashburton, on 13 October, with a script telling its tale written by Sarah Adie and narrated by Ian Price. The pianists will be playing on the festival's replacement Bosendorfer. The festival has 30 concerts this year and its theme, appropriately enough, is Arrangements and Transcriptions. Before I hand you over to today's Independent for my piece about Fiona Shaw and The Marriage of Figaro, I have to tell you a little about last night. I went along to Myra Hess Day at the National Gallery, where the Menuhin School Orchestra, Piers Lane, Andrew Tortise, The Fibonacci Sequence and Tasmin Little gave a strong, varied programme in tribute to Dame Myra Hess, in front of the Gainsboroughs and Goyas. A huge plaudit to Piers and Tasmin for playing Howard Ferguson's superb, gutsy and inspired Violin Sonata, which was written just after the war - before that, apparently, he'd been too busy organising the gallery concerts to compose anything much, and this was a sure statement of intent. But first, Tasmin played the Bach Double with a student from the Menuhin School as her partner soloist. Louisa-Rose Staples is 11, but looks 9, and is blessed with real composure and aplomb. From the first note it was clear that she was utterly secure with the task in hand - you knew at once that she couldn't put a finger wrong. She played like a complete pro: musical, responsive, accurate... And of course, this is where Tasmin herself started. Louisa-Rose, like Tasmin, became a pupil at the Menuhin School when she was 8. An auspicious evening, perhaps. It's wonderful when they name a day after your musical heroine and make it an annual event. 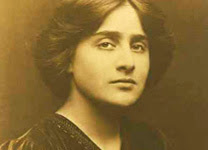 Today at the National Gallery it is Myra Hess Day, in tribute to the great pianist who, with the composer Howard Ferguson, started the now legendary series of lunchtime concerts there during the Blitz. Three concerts are held during the course of the day in the same space that the musicians used in the 1940s - though now the paintings, which were removed somewhere safe at the time, are there too. The concerts are devised by Piers Lane, who's a sort of grand-pupil of Dame Myra via one of his mentors, the late Yonty Solomon. More about the history of the wartime series and its guiding lights on the National Gallery site, here. Today kicks off at lunchtime with the Ionian Singers conducted by Timothy Salter in a programme of English music for choir. Afternoon brings a performance of Admission: One Shilling, by Nigel Hess (great-nephew) in which actress Patricia Routledge and pianist Piers Lane tell the story of the gallery concerts in Dame Myra's words and lots of music; and finally this evening Piers is joined by Tasmin Little (violin), Andrew Tortise (tenor), Fibonacci Sequence and the Menuhin School Orchestra to perform some Ferguson alongside Bach, Schubert and Mahler, plus a world premiere from composer Benjamin Wallfisch. Afternoon and evening are sold out, but I think you can still get in at lunchtime. It's an extraordinary, hot, sunny Sunday and it seems everyone wants to go and play outside - but for the few doughty souls (seen the ticket availability?) who are attending the Boulez marathon, plus those of us who have deadlines to meet, aided and abetted by our furry friends. For the latter, both writers and felines, here's some light but very true entertainment from Simon's Cat, which oddly captures my morning so far. This weekend, all over the UK, there's a chance to take part in a charity project called 123sing! to raise money for music therapy for vulnerable children. 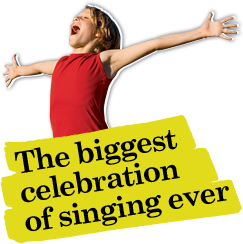 They're touting it as 'the biggest celebration of singing ever'. Whether or not it really is that, it's still a terrific idea that deserves every encouragement under the sun. It's being spearheaded by Classic FM in collaboration with Making Music, the UK's organisation that does what it says on the tin, which includes encouraging voluntary groups to get together and make as much noise as they can. Proceeds go to the Classic FM Foundation and thence to music therapy projects. If you know anyone who has an autistic child, or someone who went to Bosnia and observed the work that used to be done at the Pavarotti Centre in Mostar to help youngsters traumatised by the war, or if you saw Tony Palmer's documentary about Carl Orff - the seemingly unlikely founder of a system of music as therapy for young children who have disabilities which prevent them communicating as others might - then you'll know already that music reaches parts of the spirit inaccessible to plain language. Music therapy can change lives. Help support it: go somewhere today or tomorrow and SING. Visit the website, here, to find an event near you. This Saturday Bach thing is becoming a habit, but I could think of worse ones, so let's stick with it. Here is Richter. How do you like his performance?